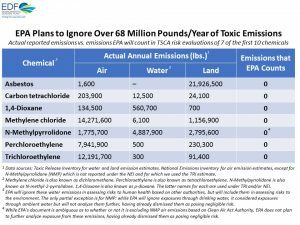 Last night, Environmental Defense Fund (EDF) submitted more than 200 pages of comments providing a detailed critique of each of the “problem formulations” EPA issued in June for the first 10 chemicals in commerce undergoing risk evaluations under the Toxic Substances Control Act (TSCA). EDF also delivered 45,000 comments to EPA from members of the public across the country echoing our concerns. EPA today revealed its severely flawed approach to reviewing the risks to health and the environment posed by the first 10 chemicals being evaluated under the newly reformed chemical safety law, the Toxic Substances Control Act (TSCA). These chemicals were selected in 2016 because of their potential dangers to the health of American families, but the Pruitt EPA has chosen to ignore many sources of exposure to the chemicals and, in doing so, will severely underestimate their actual risks. 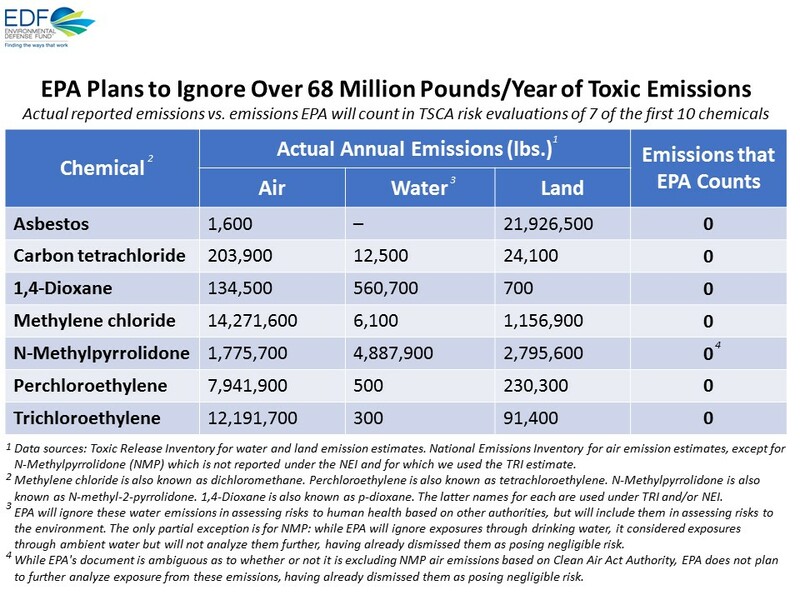 An analysis by Environmental Defense Fund reveals that EPA will ignore more than 68 million pounds of seven of these 10 chemicals released to the nation’s air, water, and land every year. Among the chemicals are known killers such as asbestos and other toxic chemicals such as trichloroethylene (TCE) that cause cancer and are linked to developmental and neurological disorders. Late yesterday, EDF joined fourteen other Petitioners in filing an Opening Brief in our case challenging EPA’s Prioritization Rule and Risk Evaluation Rule. The Brief was filed with the U.S. Court of Appeals for the Ninth Circuit. Our Brief argues that the Toxic Substances Control Act (TSCA), as amended by the Lautenberg Act, requires EPA to comprehensively evaluate a chemical’s hazards and exposures arising from all of its “conditions of use,” a term defined under TSCA as encompassing the chemical’s entire lifecycle from manufacturing and processing to use and disposal. EPA is then to make a holistic determination of whether the chemical presents an unreasonable risk of injury to human health or the environment, including to potentially exposed or susceptible subpopulations. EPA’s Rules violate this requirement because EPA asserts unfettered discretion to exclude known or reasonably foreseen exposures and conditions of use from consideration, thereby ignoring potentially important contributors to a chemical’s overall risk. As a result, the Rules threaten to leave the public—especially vulnerable groups like children, pregnant women, and workers—as well as the environment inadequately protected from the potential risks posed by the thousands of chemicals to which we are exposed every day. EPA’s response brief in the case is due to the Court on July 5, 2018. As this litigation proceeds, you can find more information – including all significant legal documents – on EDF’s website. Richard Denison, Ph.D., is a Lead Senior Scientist. Lindsay McCormick is a Project Manager. Jennifer McPartland, Ph.D., is a Senior Scientist. Environmental Defense Fund (EDF) filed extensive comments yesterday on the Environmental Protection Agency’s (EPA) proposals for the two most central “framework” rules mandated by last year’s Lautenberg Act amendments to the Toxic Substances Control Act (TSCA). TSCA Procedures for Prioritization of Chemicals for Risk Evaluation, the rule that sets up the process EPA will use to identify high-priority chemicals for risk evaluation and low-priority chemicals that do not require risk evaluation. Both sets of comments address many different provisions of the proposed rules. EDF indicated our strong support for many aspects of the proposals, but urged changes to a number of provisions that we cannot support as proposed. In addition, we identified provisions we believe need to be added to EPA’s rules to be consistent with or meet the requirements of the Lautenberg Act. EDF emphasized how vital it is for EPA to meet its June 22, 2017, statutory deadline for promulgating these rules. Because they establish processes that will require several years to begin to yield decisions on specific chemicals, delays in promulgating them in final form so that the processes can commence in the timeframe Congress intended will only serve to undermine public confidence in the new law, counter business interests to restore confidence in the chemicals marketplace, and hamper EPA’s ability to carry out its new mandates. This is especially the case, given EPA’s appropriate recognition in both proposed rules that it will need to initiate measures as soon as possible to ensure that sufficient information will be available to inform prioritization and risk evaluation decisions. As discussed in more detail in the comments, EDF strongly supports EPA’s decision not to codify specific scientific policies, procedures and guidance in these rules. To do so would not be consistent with the law and would more generally represent bad policy. EDF also agreed with EPA’s proposal not to define in its rules complex, science policy-laden terms such as “weight of the scientific evidence,” “best available science,” and “unreasonable risk.” These concepts are best elaborated on in guidance and policy statements and best understood in the context of specific decisions on chemical substances.